Welcome to the April 2019 newsletter of Let’s Move in Libraries. This edition highlights findings from our Go4Life in Libraries mini-study, the release of the Let’s Move in Libraries logo for non-commercial re-use, updates from our Spring advisory board meeting, new books on moving in libraries, and news from the field. Follow (and share with) Let’s Move in Libraries on Facebook, Instagram, Twitter, and YouTube to stay up-to-date with what public libraries do to get their communities moving. 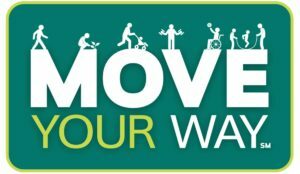 This month’s featured image comes from the Move Your Way campaign, unveiled in Fall 2018 to coincide with the release of the second edition of the Physical Activity Guidelines for Americans by the U.S. Department of Health and Human Services. According to the U.S. government, anything that gets you moving is good. The guidelines state “What counts? Whatever gets you moving!” Read more about this campaign and use it in your library to get people moving. In Spring 2019, 97 public libraries from the U.S. and Canada completed the “Go4Life in Libraries” survey. This survey asked librarians about physical activity programs they offer for older adults, their interest in offering such programs, and the partners they work with to bring this type of programming to their communities. Go4Life and Let’s Move in Libraries have been working together since Summer 2018. This report will inform future collaborations. Thanks to everyone who completed this survey! The preliminary results from this survey can be accessed here. A full report will be released in early Summer 2019. Learn more about Go4Life, which is an initiative of the National Institute on Aging at the National Institutes of Health. In December, 2017, we published the Let’s Move in Libraries logo on our website. Since then libraries across the United States have used the logo to help promote their programs, including Madison Public Library (Wisconsin), Henry County Public Library (Georgia), Baxter Memorial Library (Maine), and Fulton County Library System (Georgia). To help continue this trend, we here publish our logo here with a Creative Commons Non-Commercial License. This means you are welcome to remix, tweak, and build upon these logos. These uses must be non-commercial. We invite any librarian anywhere around the world to use our logo. Contact us to share how you use the logo in your library! In March 2019, the Let’s Move in Libraries Advisory Board met to discuss revisions to the website, strategic new directions, and more. One outcome from that meeting will be an extensive revision to the Program Ideas and Resources sections of the website in Summer and Fall 2019. Check back for updates! In June 2019, we will be inviting new individuals to join our Advisory Board. Advisory Board members serve for two years, with the primary commitment being willing and able to participate in two online meetings per year (one in the Fall and one in the Spring). Advisory Board members are also invited, but not required, to review draft documents and website revisions throughout the year. Look for the call for participation in next month’s newsletter. We are so excited to share that three new books on moving in libraries have either recently been released or are about to come out! Have you written anything recently about how your library gets people moving, perhaps on a blog, in a newspaper article, or on your website? Share with us! In Maryland, the Laurel Branch of the Prince George’s County Library has been spearheading 3D printed tactile StoryWalks that they create with young patrons using TinkerCad and a Makerbot 3D printer. Some info about the program is available here! What an amazing way of combining movement, literacy, and making! In Bucyrus, Ohio, Let’s Move in Libraries Advisory Board member Barb Scott reports that as part of her library’s continuing partnership with the United Way of Crawford County, she has been able to acquire buckets and balls for the drumming component of her HUGELY successful Music, Movement and More program. There are 30 buckets here and they plan to have an equal number of balls. They will be using Lummi sticks to drum with. In addition to producing some lovely music, this will also be a great form of cardio! In Spencer, Iowa, the public library participated in the Geri-Fit in Libraries study this Spring. The study was an overwhelming success, and Robin Munson reports that they will continue to offer Geri-Fit programs for older adults at the library on Mondays and Fridays at 1 p.m. into the future. At the Savonburg Public Library in Kansas, the library has put together a team of 6 from the library to participate in Kansas’s statewide health and wellness program – Walk Kansas. It begins March 17 and goes for 8 weeks. Savonburg has a population of 102, illustrating that libraries of all sizes can support movement! In Clinton, Massachusetts, the Bigelow Free Public Library will offer a series of health classes on Thursdays, starting on May 2 at 6:30. Check out the press release to learn more! The series centers around Yoga and nutrition. The Nashville Public Library in Tennessee used an open area on the third floor of the main library to measure out and tape down a temporary labyrinth for people to walk. Labyrinths promote relaxation, focus, and mindfulness by providing a meandering path with only one entrance and exit. From start to finish it takes about 500 steps, which is equivalent to walking ¼ mile! The Ephrata Public Library in Pennsylvania offers Workout Wednesdays weekly at 1 p.m. The library partners with Kaleidoscope Family Solutions to offer differently abled community community members a safe space to dance, do yoga, get moving, and have fun! Libraries are for all ages and abilities to get moving! The Haworth Municipal Library in New Jersey let us know that they offer the following wellness classes: (Adult) Dance for Fun, Fitness and Friendship – Mondays at 10:30 am; (Adult) Intro to Zen Meditation – Mondays at 7:30 pm; (Adult) Chair Yoga – Tuesdays at 10:15 am; (Adult) Tai Chi – Fridays at 10:15 am; and (Toddlers 2-5 yrs) Little Yogis on a 6 week rotation schedule. See website for details https://www.haworthlibrary.org/. In West Virginia, a library in Pleasants County painted stencils (Painted Playgrounds) designed to promote physical activity for young kids, outside their building. The designs were such a hit that older women, who was part of a book club that met at the library, loved to dance and move among the designs! We’d like to hear and share how you move in your library!! Share with us news from your library! Tag us on social media and email news directly through our website. We’d love to hear from you! Follow (and share with) Let’s Move in Libraries on Facebook, Instagram, Twitter, and YouTube to stay up-to-date with what public libraries around the world do to get their communities moving.